Okanagan campus Faculty of Management students, from left, Eric Binotto, Ciera Elliott, Maxime Walker and accounting instructor Sandy Hilton teamed up to win first place at the Gathering of Accounting Associates, Professionals and Students competition. Perhaps the competition did not take into account the skill of the Faculty of Management team. 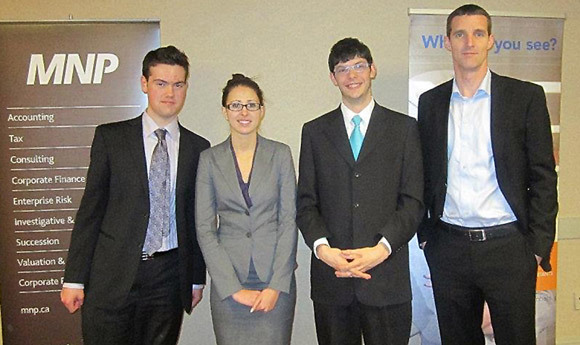 By the time the Gathering of Accounting Associates, Professionals and Students (GAAPS) was over, a team of Management students from the University of British Columbia’s Okanagan campus had claimed first prize. Ciera Elliott and Maxime Walker, of Kelowna and Eric Binotto, of Westbank, traveled to the University of Manitoba for the competition earlier this month, where they bested nine other teams from across the country. All three students are in the accounting and finance specialization, in the final year of the four-year Bachelor of Management program. The GAAPS is an accounting business-case competition where teams were presented with a seven-page business problem scenario and had a mere two hours to find a solution and make a presentation. “It was very time constrained,” says Walker. Once they solved the problem, the team then had to present their solution to a panel of judges who graded them on their presentation skills and content. In the second phase of competition, additional problems were added to their first challenge, and teams had only 90 minutes to come up with a solution. Binotto said computer problems added an unforeseen wrinkle to the final task. All three students commended their professor, Sandy Hilton.